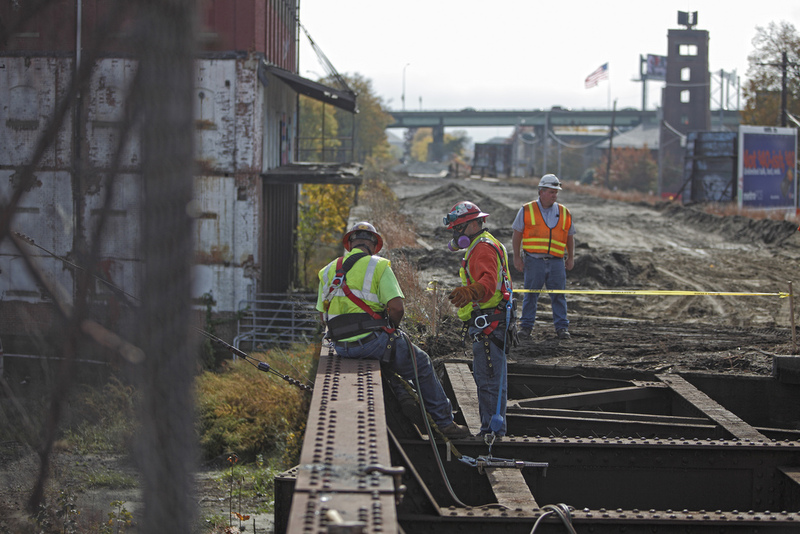 Building on the Patrick-Murray Administration’s record of commitment to the South Coast, the plan includes funding for the completion of the South Coast Rail Line with diesel-fueled commuter trains to connect Boston to Fall River and New Bedford. The $1.8 billion investment will result in greater mobility for South Coast residents and less congestion on Route 24. The project is expected to create 3,800 jobs and generate $500 million in new economic activity statewide annually. The plan will also include a $5.4 million increase in funding for the Southeastern Regional Transit Authority (SRTA) in FY14. The South Coast investments in the plan, including interchange improvements at Routes 24 and 140 in Taunton, improvements to Route 6 and Fauce Corner Road in Dartmouth and reconstruction of Route 18 from Cove Street to Griffin Court in New Bedford, are designed to ensure regional transportation equity, create jobs and expand economic opportunity. The plan addresses systemic budget deficits at the MBTA, MassDOT and the 15 Regional Transit Authorities, much of which has been caused by the debt burden related to the Central Artery. This additional investment will allow the RTA’s to end the practice of borrowing, with interest costs, to fund annual operating costs by instead forward-funding each agency. Beginning in FY15, the additional $100 million will be used to expand RTA service by adding hours of operation, increasing frequency on existing routes and adding new service. This new investment will allow the MBTA to close its current and projected budget deficits, much of which is caused by the debt burden related to the Central Artery public transit commitments. Beginning in FY2014, $25 million in annual operating funds will also be available to provide modest service enhancements such as possibly expanding evening hours, restoring weekend service in areas that have been cut and improved customer service. Improvements to SRTA and the construction of South Coast rail are certainly good for New Bedford and Fall River, but it does not address the fact that those cities are in Providence’s metro area and the Commonwealth and Rhode Island continue to fail to have a regional transportation plan across the state border that splits Providence’s metro. I too think that is not just a coincidence that the Fall River/New Bedford areas share some of the same economic problems as RI does despite the fact that Massachusetts as a whole is doing far better economically. Imagine how much better MA’s numbers would be if it were not for FR+NB? It should help to have a Governor who is a well liked former Senator when seeking funding from Congress. By strengthening the connection to Boston and weakening their connection to our metro area, this will likely further hurt RI. Jason, there’s no danger of South Coast Rail in its present form being anything even remotely approaching a successful project, let alone strengthening the connection of Fall River and New Bedford to Boston at the expense of Providence. What the South Coast Cheer Squad and various other involved parties don’t like talking about is that they’ve bargained away most of the project’s value in NIMBY hostage concessions – care of Taunton and Raynham, the majority of the new ROW is being designed as single-track and, as such, is physically incapable of supporting the schedule load they are claiming for it. And, in light of the new CapeFLYER weekend excursion train service starting up this summer, it’s worth pointing out that the design of South Coast Rail completely ignores any potential tie-ins for future intercity service, most notably, a resurrected Cape Codder service that would connect Providence to the Cape via Taunton and provide a one-transfer option for commutes between Providence and Fall River or New Bedford. The ROW from Fall River to Newport is also intact, and the extremely unfortunate positioning of Providence Station relative to the East Side Rail Tunnel combined with the existence of the beloved East Bay Bicycle Path and the political climate of Barrington means that South Coast Rail and a transfer is probably the only viable route from Providence to Newport – it’s certainly the path of least resistance. Politics, unfortunately, is where we can assign most of the blame for South Coast Rail’s eventual, inevitable failure – which is a damn shame, because Fall River and New Bedford really do need mass transit access to Boston and Providence. In a diagram “Initial Alternative Routes for NEC Spine and Connecting Corridors,” presented at the NEC Future December Dialogue in Boston illustrated a potential corridor link from Providence to Fall River/New Bedford to Cape Cod. It’s probably not a priority for the FRA – NEC Future group, but they at least considered linking the three main metro cities and the Cape. Unless there’s local political support starting with mayors, who could in turn could advocate for such a rail link with state(s) and congressional officials, it’s unlikely for this to become a reality. Going in the opposite direction, there was the Mayor of New London who went to Providence recently to meet with the Mayor Taveras and state officials looking for support to extend the Shoreline East route to TF Green and Providence. I never heard anything about that again following that trip. It may be a compete fantasy, but with the DMZ between RI, MA, and CT and the transit agencies that can’t cross state lines, a Southern New England regional mass transit summit should be held to bring together all the parties to develop a transit strategy for the region. Wouldn’t that be novel. CDOT has standing plans in place to extend Shoreline East out to Westerly the minute any commuter rail service from the north gets there. There’s a layover yard that would be jointly shared between the two services. As replacing all of these bridges with fixed span equivalents is just not possible despite us somehow managing to get fixed span bridges done for I-95 (and this is especially infuriating as you can look out at the fixed span Interstate Highway bridge paralleling both the Thames and Connecticut River crossings) and there’s absolutely no political will to stand up to the hostage takers at the CMTA, I certainly wouldn’t expect to hear anything on SLE to Providence again – not for a while, at least. There’s also the part of this where the Patrick Administration has decided to finally properly fund transportation (roads and mass transit) once and for all and stop kicking the can down the road (and potentially risk lots of political capital in form of higher taxes and introduction of VMT, etc.). That’s all pretty exciting isn’t it? Actually, scratch that, Patrick did not end up proposing a VMT to pay for transportation improvements as had been proposed earlier this week. Instead he called for an increase in the income tax to pay for transportation. Fully fund transportation? Does this mean Patrick is finally going to get the state to assume all the debt that it offloaded on the MBTA, and spin the Big Dig mitigation debt to the Turnpike to deal with? Also, if SLE and South County rail service meet up at Westerly, that’s going to be close to 250 km of electrified railroad running diesel commuter service. CDOT is going to start utilizing M8s for SLE service once the M8 order is actually completed (in 2014, IIRC), and the existing diesel sets are going to be shuffled over to New Haven – Hartford – Springfield commuter service. Now, since nobody bothered to stop and think that maybe it would’ve been a smart idea to electrify the third track we built for the commuter rail extension into Wickford, nor are the platforms at Wickford or T.F. Green electrified (and frankly, I think a failure to electrify T.F. Green’s platform is a far larger misstep than the construction of Wickford was, and it is going to hurt us far more the instant we get serious about flagging T.F. Green as an Amtrak stop), I don’t think that the span between Kingston and Providence should count as electrified railroad for the purposes of “how much electrified railroad do diesel commuter services operate on?” Nor should the span between Providence and Pawtucket count if the state fails to electrify Pawtucket’s platform(s). Electrifying track 3 west (south) of Providence is far more complicated than you might think. This was build primarily for freight trains with the capability of running double stack car carriers. The vertical height difference between electric passenger rolling stock and these specialized freight cars is considerable. I am not sure if there is some sort of modified electrical overhead system that can accommodate both types on the same track. Just to add that this situation would only affect TF Green station and other ones built north of Quonset/Davisville so Wickford’s track 3 could be electrified as well as anything south (Kingston& Westerly). Excellent point, except for the fact that a) P&W isn’t running and doesn’t plan to run any of these double-stack freight trains and b) Amtrak actually outright owns the Northeast Corridor from state line to state line – the state of Rhode Island is one of the few places where Amtrak gets to call the shots on track operation rights rather than having to lease them from someone else. As such, there’s nobody with a legal leg to stand on who can stop them from electrifying FRIP and preventing double-stacks from operating on it if they so choose. I maintain that in light of those two points and especially given how pro-passenger rail P&W is, it was a completely boneheaded move on RIDOT’s part NOT to electrify. We’ve been given so many advantages and assets for our rail services that other states would kill to have and we squander them, time after time after time. Amtrak’s in the process of building (electrified) passing tracks for the Acela and adding high-level platforms to both of these stations. Kingston should be done either late this year or early 2014, in fact. It seems the car carrying freight cars are indeed being used quite often. I also have regular communication with folks directly involved in rail matters in RI and can tell you that this is simply a much more complicated issue than most realize. Believe me, I would like to see it happen but it may take some time and lots of money. Mental757: Car carrying freight cars are not necessarily double-stack freight cars. The associated photos linked in that article seem to suggest a car-carrier that’s barely larger than a standard bilevel passenger coach – well within the clearance provided underneath the catenary. Certainly, as the FRIP track is on the wrong side of the two electrified tracks relative to Quonset and the Port of Davisville, this carrier would have had to cross under the catenary at some point. I note also that the article makes specific note of two carriers being used, one or both of which contained more than 80 individual freight cars. This is consistent with what I understand to be standard operating procedure for P&W – they prefer to run longer consists rather than double-stacks. This is not nearly as complicated of an issue as you (or whoever you are in regular communication with) are making it out to be. Wow! Now the cost for a broken rail “extension” with a cost-benefit analysis of less than 0 is up over $4 billion? Great news, especially on the heels of (you can set your clock to it) the MBTA’s annual threat to hike fares and cut service if they don’t get assistance in plugging their deficit. Here’s a better idea: don’t spend the money on the worst thing to happen to commuter rail since Wickford Junction, and the Green Line Extension, the Blue Line Extension, electrification for the Fairmount Line and high level boarding for every stop that still needs it on the Providence Line are all paid for with the surplus money left over after solving the MBTA’s perennial budget woes for the next two decades. Mass. House / Senate transportation bill does not provide funding for South Coast Rail. The proposal, as opposed to the transportation plan offered by Gov. Deval Patrick, focuses on removing the operating deficit within the state’s transportation system instead of adding new projects. That means among the items included in Patrick’s proposal that are not part of the legislative plan are the expansion of rail service to Fall River and New Bedford, or the expansion of South Station in Boston, which is viewed as a necessary component of the South Coast Rail plan.